time spent in the kitchen a little easier. 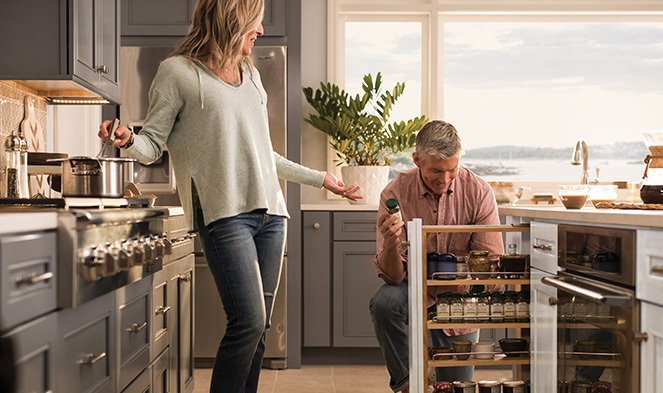 Start imagining what’s really, actually possible in your kitchen—or your bath, wherea lot of our innovations can be cleverly included. Prevent wasted space in corners or small spaces. Deploy cool Auto-Open technology for when your hands are wet or full. Include perfectly-fitting OXO canisters or Rubbermaid® containers. Improve storage. Organize anything. Really, anything at all. These clever kitchen and bath ideas solve problems you maybe haven’t even realized you have.